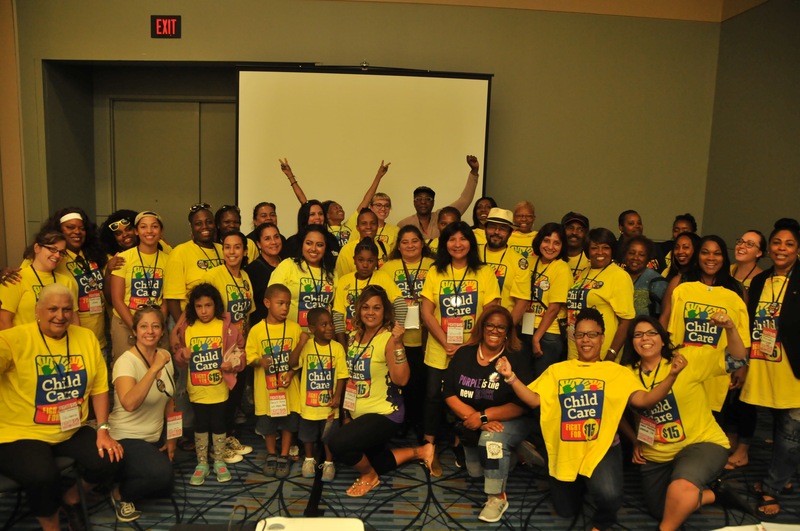 Nearly 300 child care providers and their supporters from across the country travelled to Richmond, VA late last week to join thousands of underpaid working people at the Fight for $15 convention. At the former capital of the Confederacy, underpaid workers from more than a dozen industries drew links between the crisis of today’s falling wage floor and the effects of racist policies that have held back working people of color. Furthermore, child care providers held their National Organizing Committee meeting, spoke and participated in the convention–including leading the entire convention in song–and joined thousands of protesters in a march down Monument Avenue to the Robert E. Lee Monument. Child care provider Dawn O’Neal is quoted on WTVR (CBS) and WRIC (ABC). Take a look at the Facebook album and highlights from Twitter.